Aria Beth Sloss is a graduate of Yale University and the Iowa Writers' Workshop. She is a recipient of fellowships from the Iowa Arts Foundation, the Yaddo Corporation, and the Vermont Studio Center, and her writing has appeared in Glimmer Train, the Harvard Review, and online at The Paris Review and FiveChapters. She lives in New York City. Find her on Facebook or via her publisher, MacMillan. I had the great strange fortune of giving birth to my daughter two weeks after Autobiography of Us came out, so the two events are forever destined to be linked to one another in my mind, like conjoined twins. One day, I was my own independent, self-contained being; the next, there were these two parts of me wandering around, both of which needed me to varying degrees. It was an utterly bizarre experience, one I wouldn’t change for the world. I suppose the best part of having a book excised from one’s own mind and imagination is getting to see it walking around on its own two legs. For me, at least, it was an enormous relief to see my book on actual bookshelves in actual bookstores – I’d carried it around in my head for so long, I think there was a part of me that wondered if it actually existed. Autobiography of Us is about two friends who came of age in the early 1960s. What drew you to this topic and how do you feel it is relevant to the lives of young women today? My mother came of age in Pasadena in the same general timeframe as the characters in Autobiography. Her upbringing was certainly the inspiration for the book, but as I began work on it in earnest it became – as all books become about their authors – about me. My choices. My questions. My concerns. So what began as a kind of exercise in empathy quickly morphed into sheer ego. But I don’t know how else it works. My curiosity about my mother’s life and how, as a talented, vivacious, dedicated artist, she ended up nudging her career aside to shoulder the enormous burden and joy of raising three children, is very clearly a curiosity about the landscape I found myself in during my twenties, and one I find myself in (if slightly altered by the appearance of an actual child, rather than the prospect of one) today. I know I’m supposed to feel things have changed drastically for women over the last fifty years, but I don’t. There are more opportunities, sure, but the ceilings are still there. The biases are still there. The question of how to have a family and do meaningful work is still one that, quite frankly, men simply don’t have to ponder. It’s just not expected of them. And unless science invents a way for men to be the ones carrying children, giving birth to them, and nursing them, I’m afraid I don’t see an end to that imbalance. So even if many of the situations I present in the book don’t come up in quite the same ways – women do go to medical school now, though of course I’d argue they are in no way encouraged the way men are, and women do legally have abortions now, though again, for God’s sake, look at the state of that debate here in the United States, it’s appalling – I don’t think there’s a single one that isn’t alive and kicking in one form or another today. For much of the novel, Rebecca is in thrall to Alex’s charisma. Should we consider her a reliable narrator? I have to admit, I’ve never been a fan of the concept of the “reliable narrator”. What does that even mean? We’re taught about it from such a young age, I wonder if we ever stop to question its efficacy as a way of talking about character and storyline. It’s a teaching trick, really, a way of prompting a discussion of how and when we receive information throughout a narrative. But really, narration comes from character. So does structure. How a story is as told is every bit as revealing of character as the story itself. So if a narrator withholds information, that’s telling us something about who that narrator is. If a narrator flip-flops around in time, starts a story and then stops, offers a revelation and then immediately retreats into paragraphs of physical description…well, we’re starting to get a feel for that character, aren’t we? In Autobiography, Rebecca tells the story the only way she can. Alex would tell it very differently. Eloise, Rebecca’s mother, would tell it completely differently from either of them. And so on. Alex’s charms, her charisma, the thrall she holds Rebecca in – yes, that’s reflected to some degree by the other characters and their reactions to Alex, but again, even that information we’re receiving through Rebecca’s eyes and ears. There’s a lot of information we don’t get in Rebecca’s story, about the characters in her world and about the world at large; that isn’t because I, the writer, didn’t think about those things. It’s because Rebecca is who she is. She’s very careful. She withholds. She’s uncomfortable with certain topics, she’s slow to disclose. So the story unfolds as she would tell it. There’s simply no other way. I enjoyed the repeated imagery of things – such as the restaurant where Rebecca goes to work – being less than glamorous under the surface. Does this reflect the false self the women presented to the world? I love that idea! This is part of the marvel of having a book in the world, the fact that every reader will notice and digest different bits and pieces, like different species of birds rooting through the same patch of dirt for their favourite bugs. I never consciously considered creating imagery to suggest what you’ve picked up on here, but certainly, yes, this sense of things not being as they seem is one I felt the entire world of the book to be permeated by. Alex disparages the feminists who are her neighbours with their consciousness raising groups and pity for women like her. 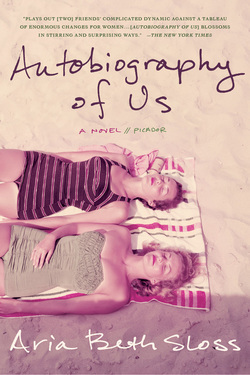 Do you consider Autobiography of Us to be a feminist novel? Ah, “feminist.” That poor word. I was certainly very interested in exploring the different dimensions of that term as a definition, both as it’s applied to women by society at large and as it’s applied by women to one another. In the specific case you mention, I was trying to zero in on what I felt at the time to be the particularly fraught relationship between women like Alex and Rebecca, who were born a few years too early to really take part in the sexual revolution, and the women who were born soon after, women who came of age with consciousness-raising groups and Second Wave feminism. The root of this book – its origins, really – was what I have always felt to be this great injustice, the cruelty of being born too late to settle for the prototypical suburban housewife model of the 1950’s and yet too early to benefit from the social changes that swept the United States in the late Sixties. I felt very strongly that the women born into that very specific window of time suffered enormously, through no fault of their own. How terrible to be able to see change, but to have it occur too late for you to benefit from it. But your question is about the novel itself, I suppose, and I’m not answering that. I’ve heard from varying sources that it’s a depressing novel, a bleak one. But I think –I hope – that it is above all else an honest novel, one that’s true to the experience of this specific group of women and true, on some level, to the experiences of women at large. To that end, then, yes, I consider it a feminist novel. I like the title for its ambiguity. How did you come up with it? I’m loathe to admit this, because I’d like to say the title sprang from me fully-formed, like Athena, but the truth is that it took me years to figure it out. Part of that is, of course, that I didn’t really know what the novel was about. I have a pet theory that titles help you focus a piece of writing – an essay, a story, a book. I think they can help separate the gold from the chaff. One afternoon I was staring at my bookshelves, as I often do when I’m stuck, and my eyes landed on Anne Carson’s magnificent Autobiography of Red. I adore that book. I think it might be one of the most perfect works of art ever executed. I think I also probably had Lucy Grealy’s memoir Autobiography of a Face rattling around somewhere in my mind; I’d always found that title arresting. I liked the idea of an autobiography penned by someone – or something – unexpected, and after a day or two of letting that idea swim around in my subconscious, I sort of just jolted upright in my chair and blurted it out to my husband, who was in the next room. I knew the moment I thought of it that was exactly the right title. And really, naming the book helped me finish writing it. What did you most enjoy about writing Autobiography of Us and what did you find most challenging? Is it depressing to say I enjoyed being done with my day’s work, the freedom of those evening hours when my computer remained shut? Writing is lonely work. It can be quite dispiriting. I wrote most of Autobiography of Us in the little room at the back of our apartment that now belongs to our daughter. My dog, Jackson, who died not long after the book came out, waited patiently in that room all afternoon every day until I got up, closed my computer, and took him out for a long stroll. The satisfaction of having put in my allotted hours, no matter what they produced, and rejoining the rest of the world, was terrific. The challenge, of course, was everything else. It was long. This bears repeating: it was long. I started this book, or what might be called some distant, long-dead relative of it, my first year of graduate school. I had no idea it was a novel. I thought it was a story; it just kept going and going. I worked on it for a year, and then, at the end of the year, decided I never wanted to see it again. I think this may be a familiar emotional reaction for many writers who’ve found themselves unexpectedly writing a novel. But something about it had gotten its teeth into me, and I ended up going back to it after I’d moved back to New York. I worked on it for about two years, I think, and then sent it out to a handful of agents. When I first met with my extraordinary and brilliant agent, Claudia Ballard, what struck me immediately was the energy and vision she had for the books: there aren’t many agents who will throw themselves into the nuts and bolts of a book like she did, and I felt right away that I needed one who would. She was a saint. She worked on the book with me for at least another year before sending it out. To her credit once again, she very carefully selected a group of editors who she thought might respond to the book; we ended up having a few make offers, and from that I ended up with Sarah Bowlin, who I also chose in large part because of her vision for the book. Then Sarah and I worked on the book for another year. Then it was done in time for a fall publication, which Sarah felt wouldn’t be the right time for the book to come out as that’s when all the heavy –hitters come out, which means debut novels get even less than their allotted tiny space for reviews. It was pushed to the following winter. I wrote the first page of the first draft in August of 2005, and the book was published in February of 2013, and my heart broke many, many times along the way. But honestly, I wouldn’t have had it any other way. That was how long it took to produce the very best, most honest work I could produce at the time, and I will never regret any of that. I don’t plan anything. I wouldn’t even know how to begin. The only way I know how to figure out a story or a character is to start writing. It’s always something small that sparks the impulse – a scrap of conversation I’ve overheard, something I’ve read, a look two women in a restaurant exchange – and the big stuff, the actual whens and whats of the story, only emerge through pages and pages of exploration. I suppose it’s largely about voice for me: I was a classical musician for years, and I seem to be haunted by that early training. Everything gets processed through my ear. I’m sure I was told all kinds of helpful and encouraging things in school, but recently my friend Leanne Shapton, who happens to be one of the most brilliantly creative human beings I’ve ever encountered, looked me straight in the eye and said: “When you’re doubting something, or when someone else doubts it, just make it weirder.” I love that. I’ve been trying to take it to heart. Go deeper. Tunnel inward. Dig into the stuff that makes your work yours. I think “write what you know”, the way it’s commonly interpreted, is terrible advice. Write what you know emotionally and psychologically; write what you’ve felt, the angers and despairs, the slights, the tiny joys, but for God’s sake don’t feel hemmed in by the physical particulars of your own daily routines. Life is big. The world is enormous. You are a human, and the human experience in its entirety belongs to you. What drives you in general as a writer and keeps you going when the going gets tough? Sometimes – especially now, with a small child who becomes more and more of a person every day – I’m not sure I have any drive left. I think: I’ll surrender. Just close my computer, toss it gently out the window, and find some other way. But I get agitated if I go too long without writing. I start to feel only half-there, half-present. So I write out of a sense of self-preservation, really, or self-defense. I write so I can feel present in the world. I think most writers tend to have that sort of physical reflex, an itch to get under the surface of things. Something that needs desperately to articulate the unarticulated. That’s what makes us such bad dinner guests; instead of making conversation, we’re all just sitting there trying to figure out what makes everyone else tick. I’ve just finally started working in earnest on a new novel, about a child prodigy. The title is already there, and I’m so pleased with it I’m going to blurt it out right here: LITTLE MONSTER. How can I not say ULYSSES? But also, well, AUTOBIOGRAPHY OF RED. And a million others. Life advice for a writer? Find a partner who understands. Without my husband’s support and understanding, I would have walked away from this madness years ago.